WD Blue 3D 500GB Review – For a long while, SanDisk was the only company to have a credible alternative to the supreme Samsung 850 Pro, in the shape of the very quick SanDisk Extreme Pro. However, with the company’s takeover by Western Digital, its line-up of high- performance drives has fallen by the wayside. After a fashion, the SanDisk name still lives on with the Ultra 3D, but it really is only in name, as the drive is technically identical to the drive we’re looking at here, the WD Blue 3D. 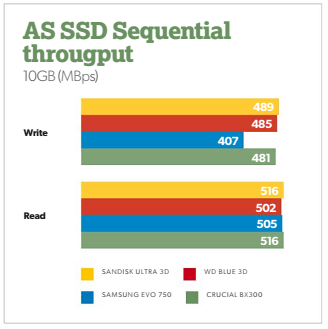 Both drives, then, are aimed at the lower end of the SATA SSD market, with prices and performance figures to match. 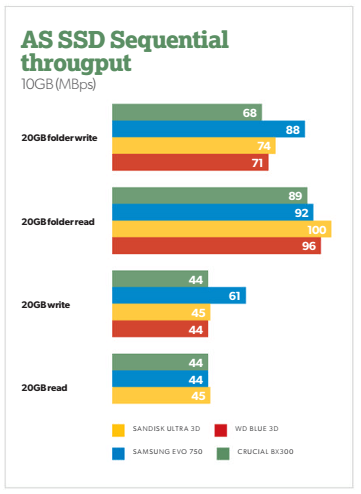 Intriguingly, Western Digital also makes the WD Green, which is an even more budget- focused range that’s only available in capacities of up to 240GB, and is even slower than the company’s other SSDs. 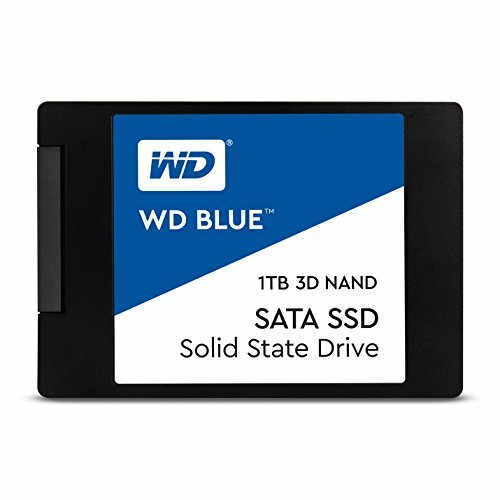 The WD Blue 3D, though, is available in four capacities, ranging from 250GB up to 2TB. It also comes in an M.2 form factor, though not mSATA. Under the hood is SanDisk’s third- generation 3D NAND flash memory, which uses a 64-layer charge trap flash technology that it shares with Toshiba. As a mainstream drive, it’s configured to run in a TLC mode, with each die having a capacity of 256Gb. It uses the popular Marvell 88SS1074 4-channel controller and, like the other cheaper drives on test, it relies on LPDDR3 DRAM to keep its performance up to snuff. The performance of the drives varies depending on capacity, though, with the 250GB model rated at 550MB/sec read and 525MB/sec write reads, while the 2TB version is rated at 560MB/sec read and 530MB/sec write speeds. All the drives manage 95K IOPS on random reads, but the 250GB drive sees a slight drop in random writes, managing 81K IOPS compared to the rest of the range’s 84K. anyway, and the warranty is a typical three years. As for write endurance, the 500GB model is rated to write 200TB, which is on a par with other lower-cost drives. Also on a par with lower-cost drives is the WD Blue 3D’s performance. 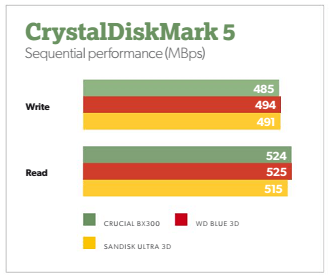 For the most part, it holds up okay, delivering SATA-maximising sequential read and write speeds, and comparable random read and write speeds to most of the other drives on test, at least in CrystalDiskMark. In AS SSD, it’s similarly okay for sequential performance, but random performance is noticeably behind even the Kingston UV400. In the IOmeter test, it beats the Kingston drive, but its 79K I0PS random read was below the rest of the drives on test. Write speeds were a little better in IOmeter, but they were also inconsistent, flipping between around 85K IOPS and 70K IOPS. Similarly, in PCMark 8, the overall bandwidth score of 224.5MB/sec is noticeably below all the other drives, except the Kingston. All told, there’s enough performance here that the WD Blue comfortably outdoes the Kingston UV400, and thanks to a more competitive price, it’s clearly the better option. However, the Crucial MX500 offers even better value, costing slightly less money and delivering consistently better performance too. As such, the WD Blue 3D is only really worth considering if you can find it at a bargain price. 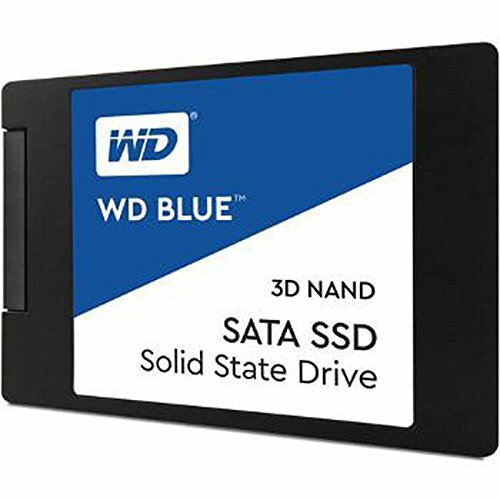 The WD Blue 3D is a perfectly decent mainstream SATA SSD that largely makes the most of the SATA interface. However, in a few areas, its performance trails the cheaper Crucial MX500, making it a solid but not outstanding choice. A perfectly capable SATA SSD, but you can get slightly quicker performance for less money from the Crucial MX500.